A 34-year-old man has been arrested over the "potential disposal" of a red car linked to the Milly Dowler murder investigation, police have said. The man, from Hounslow, west London, was arrested by Surrey detectives at 0630 GMT on Friday and later bailed. 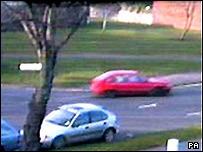 A Daewoo Nexia car was seen on CCTV footage taken in Walton-on-Thames, Surrey, on the day 13-year-old Milly went missing on 21 March, 2002. Her body was found six months later on Yateley Heath in Hampshire. A similar car was featured in a fresh appeal for information by police last week. This followed the conviction of 39-year-old Levi Bellfield for the murders of Marsha McDonnell and Amelie Delagrange in London. 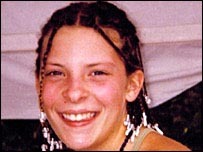 Bellfield was subsequently named as a suspect in the Milly Dowler case. His girlfriend at the time lived near where Milly was abducted close to Walton-on-Thames railway station. She owned a red Daewoo Nexia and police believe Bellfield had access to this vehicle. Officers released the vehicle registration, N503 GLT, in an attempt to trace it. In the days following their new appeal for information about Milly's death, detectives described a number of new leads as "potentially significant". Their appeal was made after images of the car were enhanced by FBI experts in the US. CCTV footage shows the car parked in the street and later driving away with apparently one person inside. Officers said the vehicle drove down Copenhagen Way, turned left into Station Avenue and went towards Hersham, at 1633 GMT, on 21 March 2002. Milly, whose real name was Amanda, was seen walking from the station and past the Copenhagen Way junction towards Hersham less than 25 minutes earlier, at 1608 GMT. She was on her way home from school. Milly's parents, Bob and Sally Dowler, appealed following Bellfield's conviction to anyone with information about what happened to their daughter to "find it in your heart" to tell police.